As rightwing political parties across Europe have attracted an increasing share of the electorate, rhetoric of a divided Europe has intensified into ever starker divisions. But is the reality as divided as media suggests? 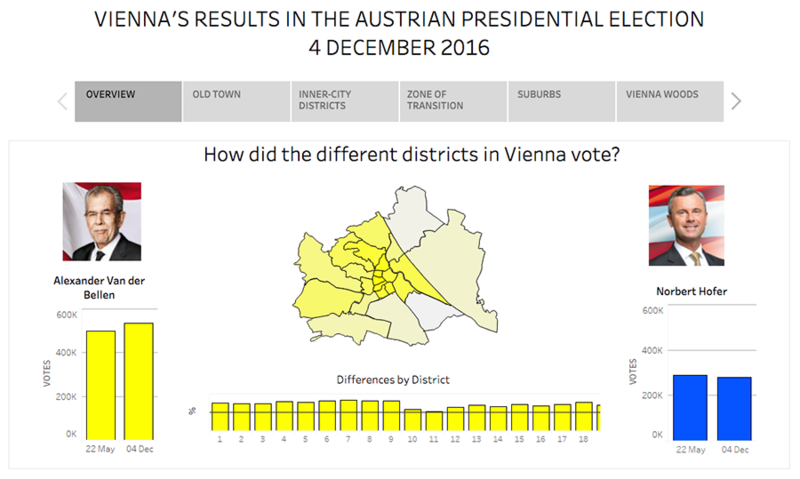 4CITIES students from Cohort 08 decided to investigate the case of Vienna’s 2016 presidential elections. On 4 December, Austria went to the polls to vote for their President for the third time in 2016. The first round was held on 24 April, with a second round run-off between the two leading candidates, Alexander Van der Bellen and Norbert Hofer, following on 22 May. However, the results of the second round were annulled due to irregularities, making a third trip to the polls necessary. In the meantime, Brexit and the election of Donald Trump raised expectations that Austria would hand victory to the FPÖ (Freedom Party) candidate Hofer, as a representative of anti-EU populism. However, Austria bucked the populist trend and voted strongly for Van der Bellen as president (53.8% of the vote nationally). The former Green Party leader gained a larger margin of victory than in the second (cancelled) round, and a majority in every single one of Vienna’s 23 districts. We mapped the preliminary election results district by district for the final presidential election, to see how the vote varied in different areas. Vienna can be thought of in terms of different regions, with their own unique character. For this reason, we have divided the city into five multi-district regions, and analysed each in turn. The 2016 presidential elections showed Austria to be a divided country. Is the capital city also divided? As explored in depth elsewhere, the presidential election has exposed a clear political divide between Austria’s cities and rural areas, with urban areas being decisive in delivering a victory for Van der Bellen despite strong support for Hofer in the countryside. This is shown clearly in this Austromorph map. Although every Viennese district voted by a majority for Van der Bellen, a closer look reveals that support for the new President is not entirely and consistently strong throughout (as shown by varying strengths of yellow on the map). Many factors may have contributed to the varied results between Viennese districts. Our maps investigate two possible factors: migration background and the electorate gap. Why? Despite extensive research into whether voting for populist radical right (PRR) parties (like the FPÖ of Hofer) can be explained by the larger or smaller presence of ethnic minorities in an area, there remains no conclusive answer. On the one hand, ethnic competition theory argues that the larger presence of ethnic minority individuals in an area will boost PRR support among the national ethnic majority group, while in opposition, the contact hypothesis argues that a larger minority presence will in fact lead to greater mutual understanding and a reduced feeling of threat among the majority group, and subsequently less support for such parties. So firstly, we focus on migration background within Vienna. In Austria, the pattern of more ethnically diverse urban areas voting for VdB while the less diverse rural areas generally voting for Hofer seems to indicate some correlation between the two at the national level. However, our mapping shows there to be little link when taking a close urban level look. Within the suburban districts, there is massive variation between the 10th District and the 22nd District in terms of population with migration background (45% and 25% respectively), yet in both 57% voted for Van der Bellen. A second factor focused upon is the electorate gap. As explained in this Metropop blog, this term refers to the difference between the total population of voting age and the number actually eligible to vote, for example due to lacking Austrian citizenship. A high electorate gap indicates a large adult population in the area unable to vote. How does the electorate gap interact with voting behaviour in Vienna? Again the link doesn’t seem to be in evidence here: inner-city districts with a large electorate gap voted strongly for Van der Bellen, but a similarly high electorate gap is evident in suburban districts 20-23, where support for the new President is weakest. These maps therefore argue against ethnic explanations for voting behaviour in the Austrian presidential election. But by highlighting the variation that does exist within the city, we hope to open the door for other investigations and possible explanations.